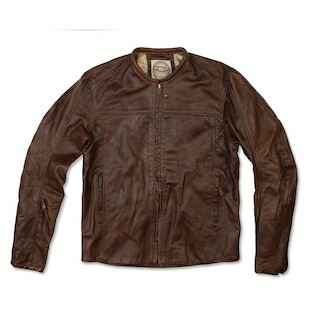 New Roland Sands Barfly Jacket! Whether you are an old school original owner, or a young buck vintage throw-back, there is bound to be something from Roland Sands Design that fits your jig. Using hand-finished techniques and only the top grain cowhide, RSD jackets carry a unique message that you will either love or hate. New for 2013, is the Roland Sands Barfly Jacket. Using the same 4-day dying and hand-waxing process as the coveted Ronin jacket, the Barfly packs the same quality and design with a differently styled punch. Vented at several points along the arms for optimum comfort and pre-configured to accept the RSD CE-rated armor, the distressed leather shell makes a statement while remaining fully functional for your riding needs. A more muted look and subtler styling make it an even better sleeper option than the Ronin. The Barfly will be available in Black or Tobacco and is expected to hit the shelves at the end of February. For a complete smorgasbord of Roland Sands, check out the whole collection at RevZilla.com.